Unlike certain diabetes drugs, a new class of drug actually increases bone mass and reduces risk of fractures. In addition to its more obvious ills, type 2 diabetes is a condition closely associated with bone fractures, increasing the risk of fractures twofold. To make matters worse, certain anti-diabetic drugs further increase this risk, particularly in postmenopausal women, severely limiting their treatment options. Patrick R. Griffin is a professor on the Florida campus of The Scripps Research Institute. 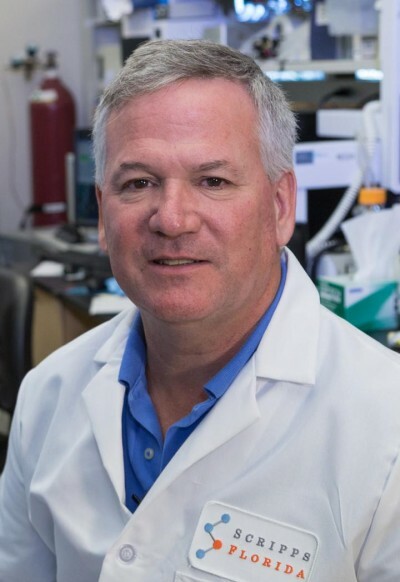 A new study, co-led by Patrick R. Griffin, a professor on the Florida campus of The Scripps Research Institute (TSRI), and B. Lecka-Czernik, a professor at the University of Toledo, has shown that a new class of drug candidates developed at TSRI increases bone mass by expanding bone formation (deposition of new bone) and bone turnover (a normal process of replacement of old bone). A proper balance of these two processes is critical to healthy bone maintanence), and this balance is frequently negatively affected in diabetic patients. The first author of the study, “PPARG Post-Translational Modifications Regulate Bone Formation and Bone Resorption,” is L.A. Stechschulte of the University of Toledo, Ohio. Other authors include P.J. Czernik, Z.C. Rotter and F.N. Tausif of the University of Toledo; C.A. Corzo, D.P. Marciano, A. Asteian, J. Zheng and T.M. Kamenecka of TSRI; J. B. Bruning of The University of Adelaide, Australia; and C.J. Rosen of the Maine Medical Center Research Institute. The study was supported by the National Institutes of Health (grant numbers DK080261 and DK105825); the American Diabetes Association (award 7-13-BS-089), the Abrams Charitable Trust and the Klorfine Family Fellowship.